Harriet and her mother Phil at Dail Eireann this week. Sinn Féin Senator, Trevor Ó Clochartaigh is calling on both the Taoiseach and the Minister for Justice to reunite a Galway couple after a wrongful deportation was carried out by her department. Raising the issue again in Leinster House this week, the Galway West-South Mayo Senator said that Minister Fitzgerald needs to act immediately to reverse the wrongful deportation in July of Brazilian- born Kleber Medeiros, on foot of spurious allegations made about his marriage to his Irish wife Harriet Bruce, a native of Ballinasloe. 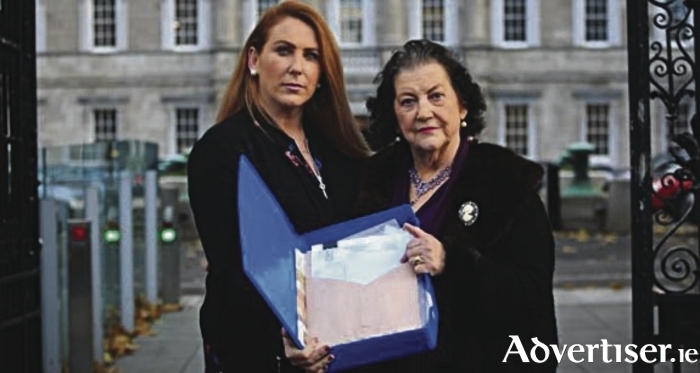 Ms Bruce traveled to Dublin this week to hand in a letter to the Taoiseach and Tanaiste to highlight the case and appeal for her husband to be allowed return to Galway before Christmas. ‘Kleber, who was working and paying taxes in Ballinasloe, was taken from his home, remanded in custody and then deported on foot of unsubstantiated claims made by a member of the public about the validity of the couples’ marriage. ‘It is clear now from correspondence from the HSE that they accept that there was no evidence to uphold the objection and that no impediment to the marriage existed,” Sen O Clochartaigh said. ‘Harriet, members of her family and friends, along with politicians from across the spectrum came with her to Leinster House this week to hand in letters to the Taoiseach and Tánaiste calling on them to allow Kleber to come home. We are calling on them to reunite the couple for Christmas, if not sooner. ‘Harriet has put the case to the Minister for Justice and she is dragging her feet in making a decision. We are calling now on her and the Taoiseach to deal with this case promptly and effectively,” he added. Sen O Clochartaigh said that it is alleged by the family that the couple were denied their Constitutional Rights and were not afforded due process, that the HSE failed in their duty to properly investigate spurious claims against the couple, that the Garda National Immigration Bureau entered their home without a warrant, removed Kleber and released him before they had to explain his detention before the High Court. They further claim that the Irish Naturalisation and Immigration Services sent a recommendation for deportation and had not fully investigated the circumstances of the case. “This would indicate therefore that the Department of Justice and the Minister were wrong to deport Kleber Medeiros and that he should be allowed to return immediately,” he added. ‘Kleber, his wife Harriett and their families’ have been subject to a huge amount of distress and expense as a result of the actions taken, on foot of unsubstantiated allegations. This is a very unsatisfactory situation for which the Minister is ultimately responsible. “Kleber needs to be allowed to return home immediately to allow this young couple to get on with their married life together in Galway again,” he concluded. Harriet was in Dublin on Tuesday to meet Oireachtas members, and to hand in a letter to Ms Fitzgerald urging her to “right the wrong” done to her and Mr Medeiros. She wants the deportation order revoked. She has just returned from São Paulo, where she spent two months with Mr Medeiros, but had to return as her business was closed while she was away, she has to pay the mortgage and her mother, Phil, is elderly. TD for Roscommon Galway Eugene Murphy said he knew the couple well, as “model citizens whose only crime was to fall in love”. Senator David Norris, said what had happened to them was “inhuman and disgusting”. A spokesman for the Department of Justice said it was open to anyone who had been deported to supply additional information to have their case reconsidered. Ms Bruce says she has done this, including providing proof she was in Brazil for two months and a commitment from Mr Medeiros’s Irish employer to hire him again on his return.